Annotations, courtesy of the author. The digital humanities at its best is about using technology to illuminate connections between people and ideas. Different projects do this differently; some are focused on connections between scholars and ideas, like the site Slave Revolt in Jamaica, 1760–1761: A Cartographic Narrative that offers a scholarly interpretation of the event described in its title. Some facilitate scholars’ connections to one another, such as the Women Also Know History project, a social media campaign that foregrounds the intellectual work of women historians Others are designed to make certain primary sources accessible to the public, to interpret those materials, or to invite others into the interpretive process, much like our own digital critical edition of the British publication of Common Sense, which invites scholars, students, and others to view the document, contribute their own knowledge through annotations and essays, and learn from one another. The digital humanities, as practiced by historians and public historians, is often about creating and facilitating connections between people who might never meet each other face to face—in other words, building imagined communities. The Age of Revolutions relied on print media to build the same kinds of imagined communities, as texts—especially Thomas Paine’s Common Sense—convinced the public of the virtue of a particular point of view. People communicated this rhetoric in print, but also discussed it, argued over it, and spread the word in taverns, where these ideas took on new forms or gained a collective momentum. Map, courtesy of the author. Paine’s Common Sense is a great example of utilizing media networks to construct imagined communities. One aspect that made Paine’s pamphlet so successful in its aim to galvanize American colonists to revolution was his accessible writing style and his use of references to well-known texts such as the Bible. One of the difficulties early patriots faced in gathering support was overcoming the very real and very distinct regional identities and experiences that existed in the American colonies. Through the technology of print media Paine was able to translate political philosophies and aims into a message that helped draw out the connections between these diverse identities and create avenues for public dialogue. Though Paine communicated concerns specific to colonists in British North America, his words resonated in localities such as England, Paris during the French Revolution, and even Lima, Peru, during its War for Independence in the early nineteenth century. From the eighteenth century to today, revolutionaries throughout the world have drawn on Paine’s ideas and modes of distributing them. Because of this global circulation, people continue to make Common Sense relevant in a variety of regional contexts. In some ways, the digital humanities can be considered as virtual public spaces. 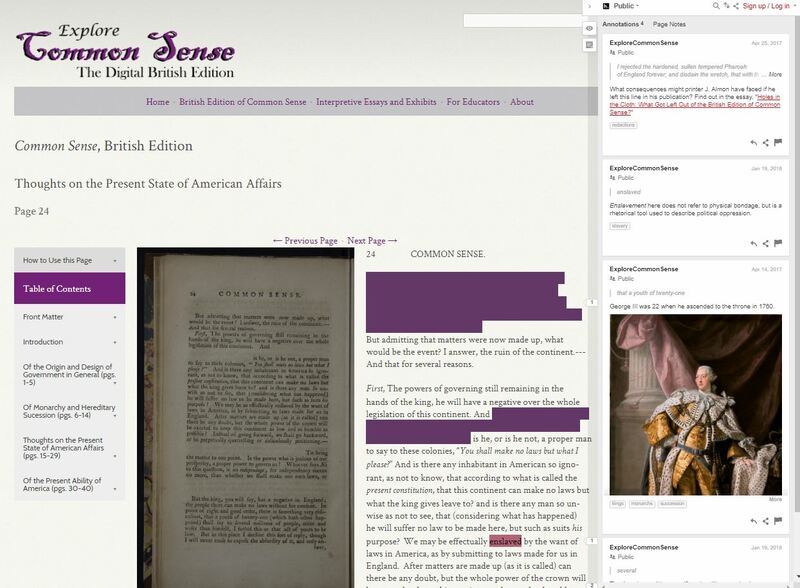 As we worked on Explore Common Sense, we realized that what we hoped to build was a digital tavern: a space where people could access Paine’s pamphlet, talk about it, and engage with it. Like a tavern, the online space in which people interact with the pamphlet is dynamic, rather than static. Ideally, the space allows people from a variety of backgrounds, with various levels of prior knowledge or familiarity with the text, to have casual and relatively immediate conversation with and about Paine’s words. Conversation can ebb and flow with tides of popular interest, and we as scholars can share new findings and respond to developments in national dialogue much more quickly than we might be able to in a more traditional academic space. 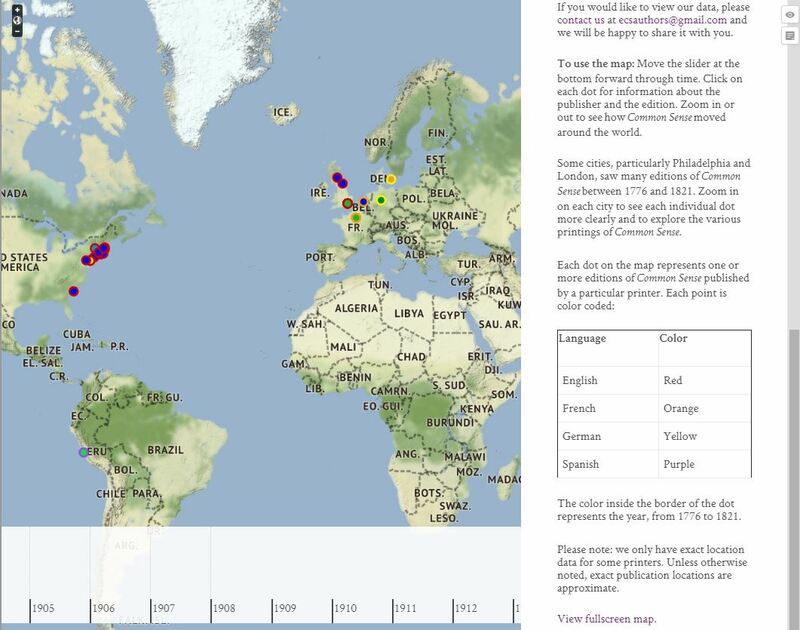 Thus, as Common Sense ended up reaching a far larger, more global network than just the American colonies, the digital humanities also allow for scholarly work to communicate beyond academic communities and into the public sphere as well. Designing and producing work that can speak to multiple audiences, academics and non-academics alike, requires no less intellectual rigor than writing traditional manuscripts, nor does creating work with layers of accessibility make the end product any less worthy of deep conversation. Indeed, by widening the circle of participants in the conversation, we can find new insights. Like an eighteenth-century tavern, it invites the participation of people from diverse walks of life. In a way, it taps into the kind of intersectional communication that was happening to a certain degree during the Age of Revolutions, as long-held ideas about hierarchy were called into question and support had to be derived across regional, class, and economic barriers. Kate Johnson is an archival assistant at the University of Northern Colorado’s Archives and Special Collections. Marie Pellissier is a Ph.D. student in early American history at the College of William & Mary. Kelly Schmidt is a Ph.D. candidate in United States History and Public History at Loyola University Chicago.